Over half the members of Northern Ireland's legislative assembly visited the University Ulster's Magee campus this week, when six of the NI Assembly's Committees held meetings in the city. MLAs from Health Committee, the Employment and Learning Committee, the Committee for the Office of the First Minister/deputy First Minister (COFMDFM), the Finance and Personnel Committee, the Public Accounts Committee and the Education Committee met senior academics and key city stakeholders for an informal lunch in the Great Hall. 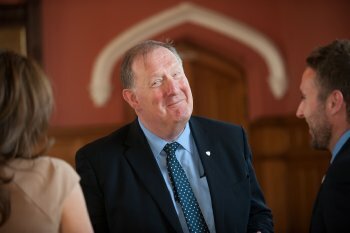 For many, it was their first visit to Magee, and said Professor Deirdre Heenan, Provost of Magee, it provided a unique opportunity to showcase the work of the campus. "We were delighted to welcome so many MLAs to Magee to see at first hand the facilities we have here – especially on a day when we are able to announce a £5.3m boost for research into brain mapping at our Intelligent Systems Research Centre." Response from the MLAs and officials was very positive, said Professor Heenan. A further visit of the Assembly's Committees is planned for the autumn.